I have been so excited to add our own touches to the new home. The next finished project is a swing out spice rack for one of the kitchen cabinets. The cabinet designated for spices is rather slim and squeezed between a corner cabinet and the microwave. This made it very difficult to do any basic organization. I found myself pulling out at least 10 spice bottles to find the one I needed. 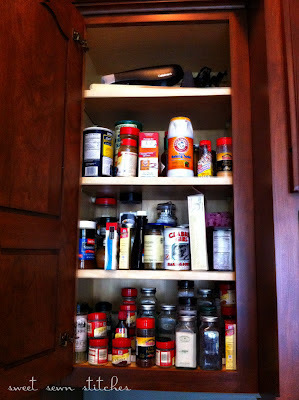 I found inspiration from a Martha Stewart swing spice rack, but they are only available in standard sizes...not gonna work for the skinny spice cabinet. 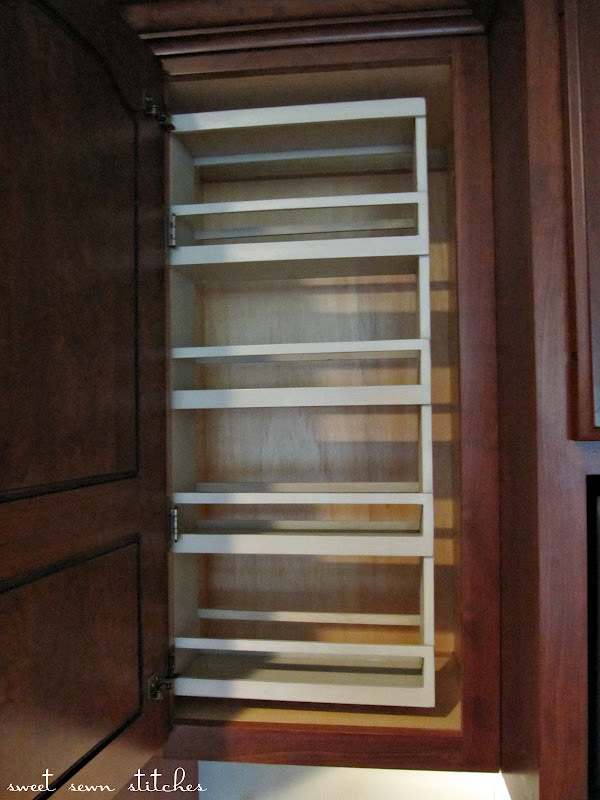 My Mom suggested I have our custom furniture guy, Wes build a similar rack that would fit. I consulted a good friend who also has a swinging rack for reference. After many weeks and much problem solving, here is the result! I could not be happier with the functionality and style!! Just opening the cabinet makes me giddy with excitement! For those who are interested in more details on the swing of the rack, we used inset hinges to mount the rack to the cabinet frame. 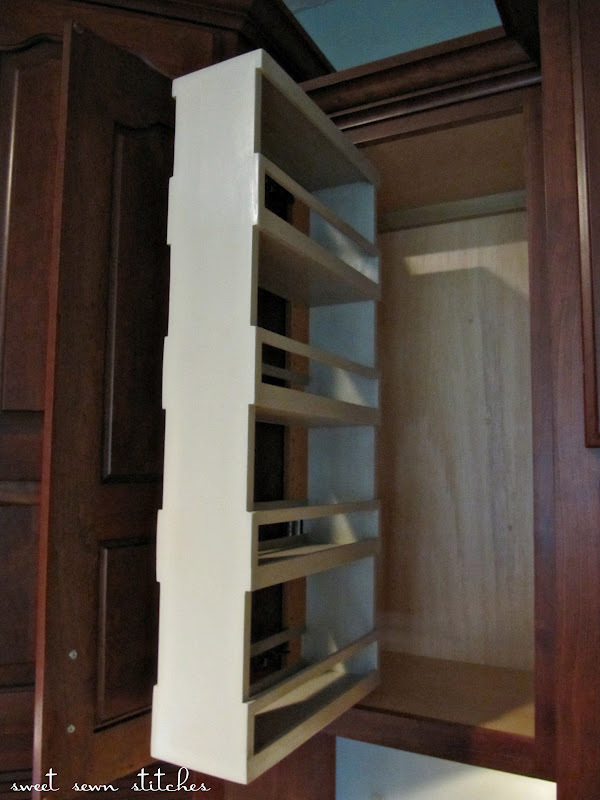 You can find the hinges here. Enjoy! This is fabulous! I totally love it. Great job. This is so awesome!!!! 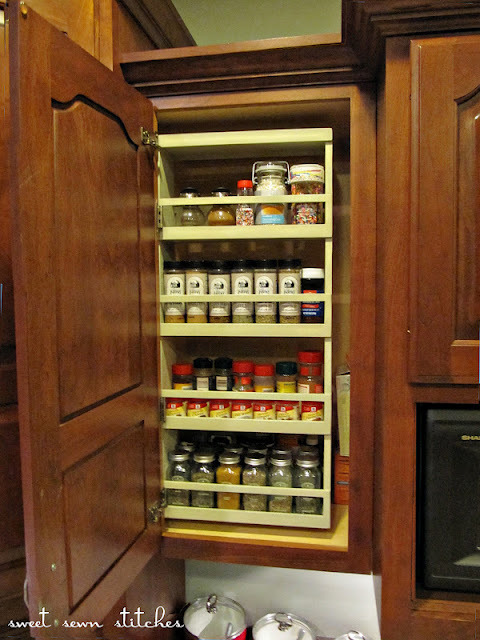 I wish I had a spice cabinet like this! I am featuring it at somedaycrafts.blogspot.com. Grab my "featured" button. What a genious idea. Love to have a handyman like yours.